Ford’s car plant in the Leningrad region will suspend production for nearly a month over the New Year’s period – giving workers an extended holiday as demand weakens. The production line would stop working from December 24 until January 21. Ford announced it was calling an extended halt to production to adjust to a worsening market situation and forecasts of falling sales across the auto industry. The extra time off will also give the company more time to prepare for the beginning of mass production of its Mondeo model at the plant. That will now start in March 2009, the company said. According to the company’s labour agreement, it will pay employees two-thirds of their salaries during the enforced layoff period. Production of the Mondeo was supposed to start in October. According to several Ford dealers, the factory will produce its first Mondeos in February, Vedomosti business daily reported. The delay could be due to the crisis, and also to a fire in a car-parts warehouse in October, the newspaper said, citing a manager at one of Ford’s suppliers. The later rollout for the Mondeo comes amid a general slowdown in Russia’s auto sales. Ford’s sales fell 18 per cent in October alone. That the Mondeo launch is going ahead at all is due to the 30 per cent import duty on new cars, said Elena Sakhnova, a transport analyst at VTB. 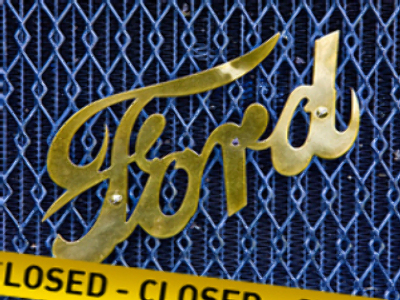 The Ford plant opened in 2002, initially assembling 25,000 Ford Focus models per year. Last year, that figure rose to 69,000 cars. Since February 2008, the company has produced 300 restyled Ford Focuses per day. The plant’s 2,200 workers are renowned across Russia for their trade union activity, and have several times forced the company to raise salaries. In 2005, workers got a 17 per cent pay rise. Two years later, workers staged a one-month strike in support of a 30 per cent pay demand. After negotiations, the trade union and management agreed on a salary increase of 16 per cent to 21 per cent.